Chocolate peanut brittle is one of life's incremental problems. Like going 70 when the speed limit is 65. Why not 71? 72? Next thing you know you’re pushing 90. Apparently the same thing happened in our candy kitchen. We were doing just fine with peanut brittle and then one incremental change in the form of chocolate came around and we're pushing 90. Now we have introduced a whole new problem to your sweet routine. Do you go plain, or do you go chocolate? I know my answer: chocolate. This is from a guy who doesn’t go gaga for sweets and doesn’t usually like savory and sweet together. Our chocolate covered peanut brittle made me throw out past preferences. There's a dark edge of caramel to its underbelly, a chocolate robe for outside. What a diabolical invention we are to endure. 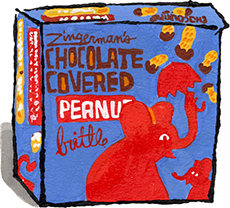 "If you thought Zingerman’s peanut brittle couldn’t get any better, you’re wrong — because they went and covered it with not one but two kinds of full-flavor, semi-dark chocolate. If you like peanut brittle but hate how it gets stuck in your teeth, you’ve got to try this. Honestly, even if you’re not a huge fan of peanut brittle, I suggest you try this because the addition of chocolate might just bring you around."